A selection of full systems are available with code in php and using a MySQL database. All code is editable and the system is customisable in WebPlus. The systems are built in a single WebPlus WPP, are easy to set-up and require no code changes to be fully operational, all you need to do is customise the look and feel. Some of the systems have features that you won’t find in other systems and are comparable with other systems available on the Internet at more than 10 times the price. Full support for set-up and basic customisation is included as are all support files. Licenses allow the use on two or more sites concurrently (see individual license terms for more details). Because they are browser client apps they are limited in functionality and are mostly simple systems, such as the 247 Shopping Template System. Some systems are available in ASP too and there are some that are ASP only. The ASP systems either use an Access Database or a MSSQL one, some are available with the option of either Access or MSSQL. To use the ASP versions you will need your site to be hosted on a Windows Server with the necessary Access or MSSQL support. Some systems, for example, the Hotel-iBooker system, are also available as fully hosted systems. I set them them up for you on a dedicated area on my server, with your own Database with up to 1GB storage. I customise the system to your requirements and maintain it for you. You have full access and control of the systems Control and Management Panels via a dedicated url. the blog Site Template System for WebPlus X6. 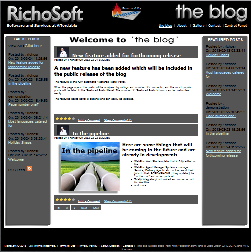 the blog is designed for WebPlus X6 and is fully customisable using normal WebPlus options. New! It is in the bag! for WebPlus X6 and Now X7. It is in the bag! 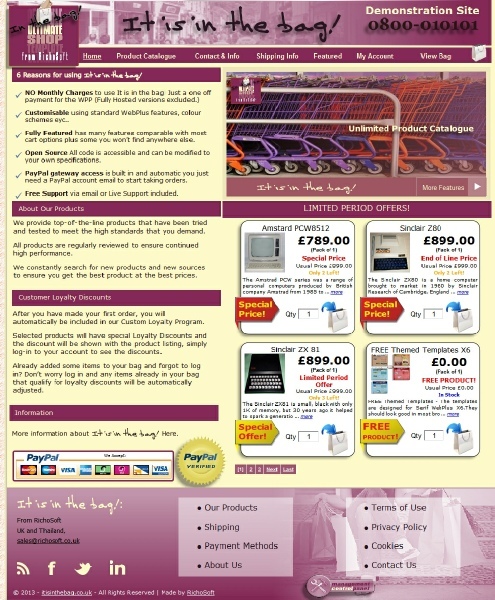 Is a full WebPlus X6 System Template for an on-line shop. It is completely built inside a standard WebPlus WPP document and uses no external servers or components to operate. (The only external link is to the PayPal gateway to get the customer’s payment). The system is built using standard WebPlus features plus additional PHP code and your MySQL database. The code is accessible and can be re-coded by anyone with a knowledge of PHP and MySQL. As the system is built in WebPlus it can be fully customised with your own colours, graphics, content and normal Webplus features. The submission to PayPal is fully automatic, all you need to enter is a valid PayPal email address. The system is built with flexibility in mind, with the options of no ship countries, physical and digital products, variable tax rates by product, customer loyalty discounts, special offers, products can be attached to drop shippers and more. Products can be displayed to the customers in grid or list formats, special offer blocks and single product blocks can be added to any page for example in an editorial page. Everything is in one X6 WPP. Specifically Designed as a Full Blog Site. Add New Posts on-line without using WebPlus Editor. Includes the ability for viewers to post comments. Includes the ability for users to rate posts. Includes automatically generated RSS Feed. Allows the uploading of images to posts or linking to existing web content. Can disable/delete in-appropriate comments easily. Automatically creates 'latest posts' panel. Editor interface can now be configured in over 60 languages. Pages included in Viewer Menu: the blog, About, Gallery, Contact (and Control Panel). Control Panel includes functions such as: Add Post, Edit Post, Manage Users, Manage Comments, Optimise DataBase Tables and more. All functions and code resides on your server and mail on contact panel uses php Mail Factory so no relying on external resources for anything. This also means that all content etc counts towards your SEO. A Single WPP means that it is easily editable in WebPlus. Setup in Only 5 Easy Steps. All ancillary files and support files included. NOW also includes an automatic 'Featured Posts' panel, posts are evaluated on the star rating and number of comments (ie popularity) and a pre-determined number of featured posts are listed in the 'Featured Posts' panel. Revolutionary - Drag and drop form builder for WebPlus X6. Drag your elements from the Ultimate Forms Template to your site document and all code and images are created automatically for you. Comes with a simple php processing script, but can use SWR too! New! 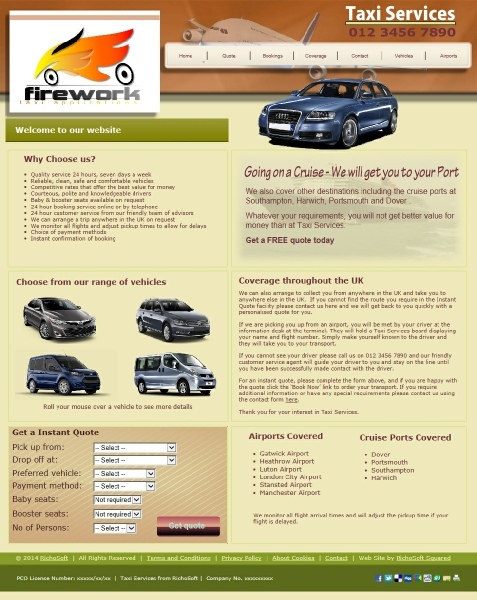 Taxi Services Template for WebPlus X6 or X7. Available in both Full Site and Mobile versions. Set your own rates and choose from distances in miles or kilometres. Calculates estimated journey times too.